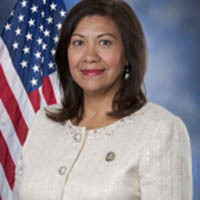 Congresswoman Norma J. Torres represents California’s 35th congressional district which includes Bloomington, Chino, Fontana, Montclair, Ontario, Pomona, and Rialto. She previously served as a State Senator, Assembly Member, and as a Mayor and Council Member in the City of Pomona. Since coming to Congress, Torres has worked to make sure Washington is responsive to the needs of Inland Empire residents. At the beginning of her term she launched a Job Creation Listening Tour where she met with over 200 business owners, employees, education professionals, and local economic leaders to hear straight from the community how best to foster economic growth and create jobs in the Inland Empire.